Mohamed Salah provided a very wholesome moment following his hat-trick for Liverpool in their 4-0 win over Bournemouth this afternoon. The Egyptian scored the Reds’ first away Premier League hat-trick since 2014 in their win over the Cherries, something that saw him handed the award for Man of the Match following the tie. 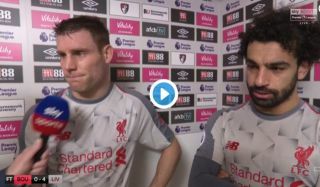 However, Salah refused to take the award, as he wanted to hand the accolade to James Milner, who was making his 500th Premier League appearance, instead. It’s lovely to see such a moment from Salah, as most players would just take the award without thinking about putting others before themselves! Hat-trick hero @MoSalah refuses to take his Man of the Match award and hands it over to @JamesMilner on his 500th Premier League appearance. ?? ?